Are you looking for a large piece of artwork for your wall ? Here is the link to the list landscape photos that will print to 1.8m. This list can be accessed through the word tag LARGE SCALE >1.8M under 'sort by' to the left hand side of each product page. If the title of the artwork is labelled with a 1.8m+ (as opposed to 1.8m), this means that the artwork will print even larger than 1.8m. You can purchase a panorama up to 1.8m in this online shop, and if you would like to purchase an panorama over 1.8m please email Lucy which photo you like and what size you would like it printed and she will check the resolution of the image and let you know if it's possible. If you don't know what size would look good on your wall then we offer a free in home / office art consultation - refer here for more details. Note the max. length of a single printed canvas is 1.8m and the max. width of a single printed canvas is 0.8m Large printed landscape canvases over 1.8m are produced in 3 pieces (triptych). Prices include GST. The reason all panoramas print to different sizes (and there isn't a 'standard') is because the photos have been shot over 8 years, with different digital cameras of differing resolutions. Lucy uses the Canon 5d range of digital cameras, and with each new camera that is released there is a large gain in resolution, thus the images can be printed larger. Also the panomamas are digitally stitched from many photos and the more photos that have been shot for any given panorama, the larger the image can be printed. 3m wide large scale Auckland City at Night canvas triptych. 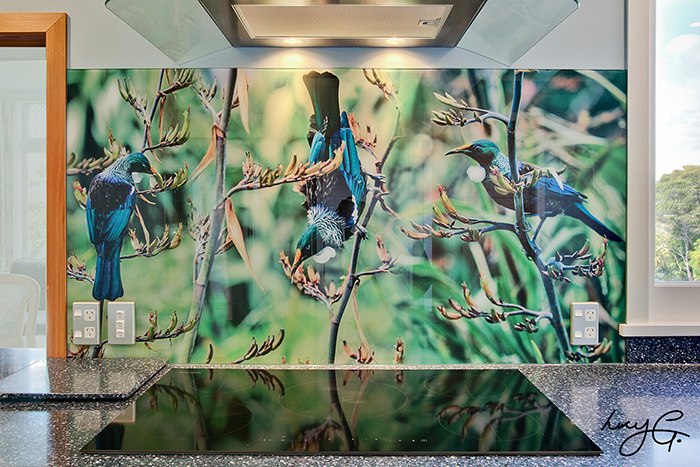 1) Glass - for the ultimate 'large scale' artwork we can print our photos onto the back of glass and adhere them to your wall. This is how our kitchen splashbacks are produced, please refer to the Lucy G printed image on glass website. 2) Acrylic - for a lighter weight but slightly less durable substrate acyrlic can be used instead of glass and we print to the back of acrylic. 3) Wall paper / vinyl - different types of wall paper & adhesive vinyl are available for both residential and commercial applications, refer to images below. 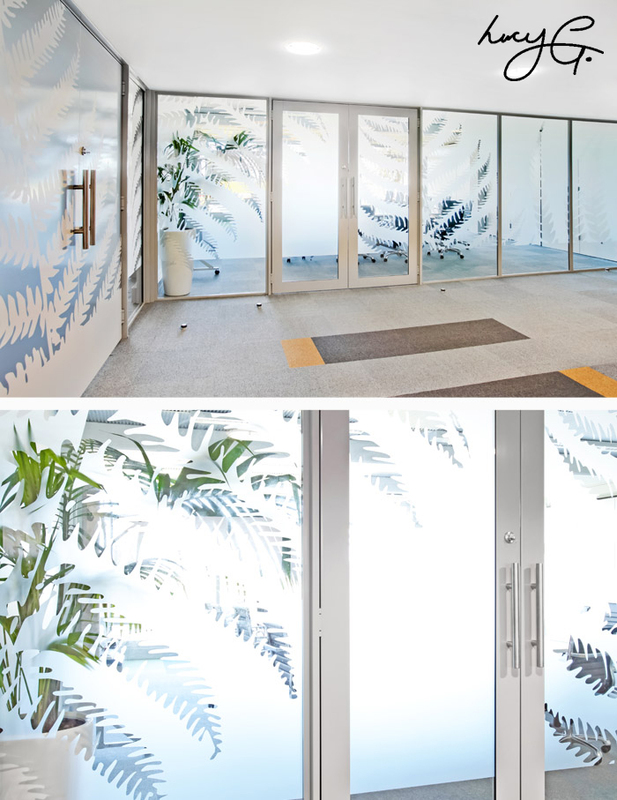 4) Window film - clear, opaque and white window films are available to print to, refer to images below. 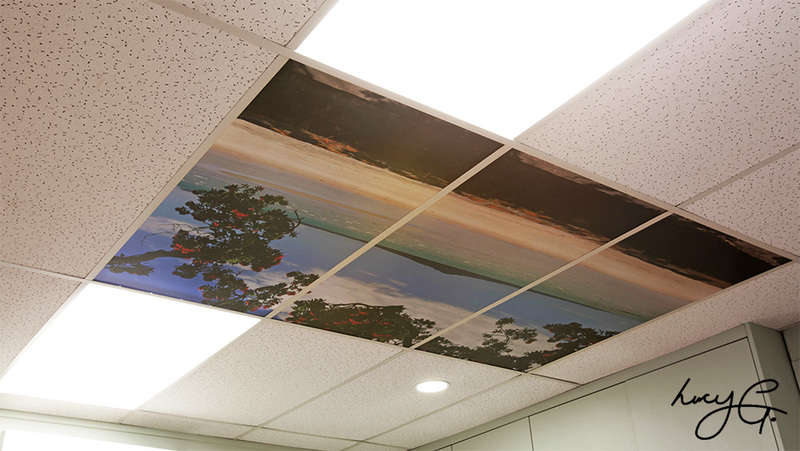 5) Ceiling tiles - for a large scale ceiling artwork refer to our section on ceiling tiles or refer to the image below. 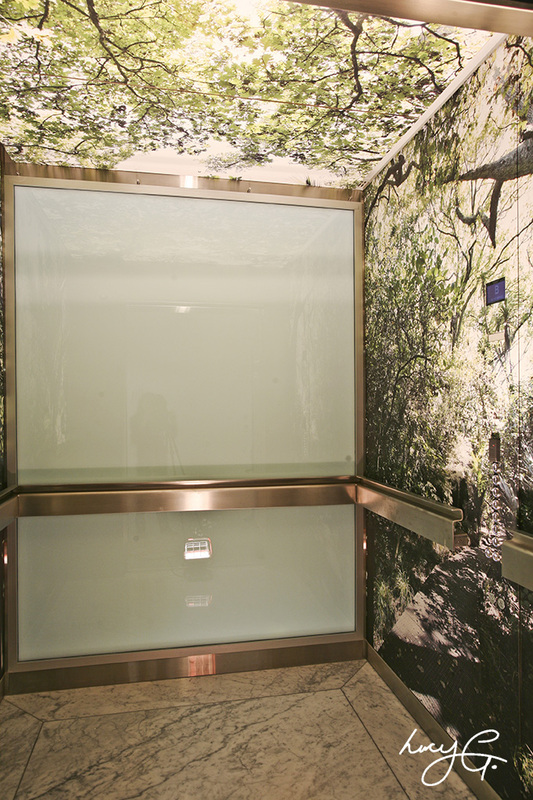 NZI buildling wall & ceiling printed vinyl lift shafts. 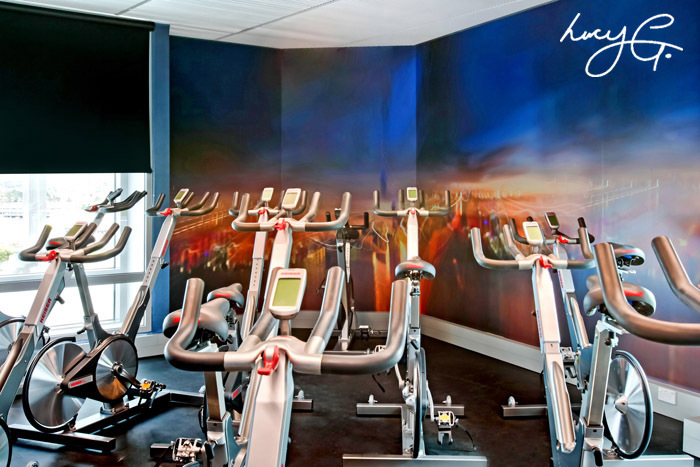 Millennium Gym printed wall vinyl image in spin class room. 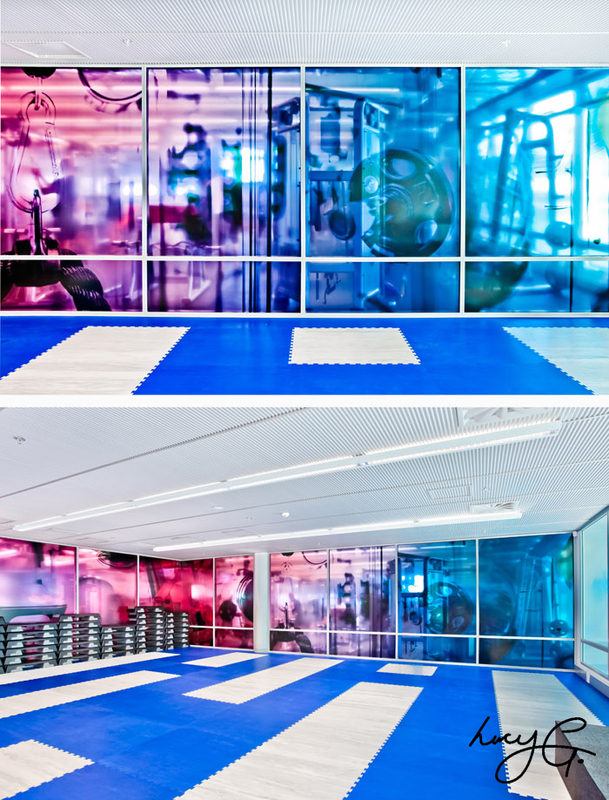 Millenniium gym printed clear window film for aerobics room glass walls. Printed ceiling tiles for Springdale Clinic. Computer cut fern graphic for meeting room privacy.